Where have I heard that song before??? I am a scrapbooker. Have been for many years. And it’s a running joke among my scrappy friends that I don’t scrap my life, I scrap events. So I have books of vacations, books of weddings, books of babies, but no books of everyday life. This running joke of my life being lived in themes has prompted different discussions over the years as to what book I should do next. There was actually one proposed that I thought was really cool, and have started assembling the materials to make it but haven’t gotten as far as actually putting it together yet. The idea was to pick the ten songs that were the autobiographical soundtrack of your life. The ten songs that can tell people who you are with no explanation, or tell of events in your life. I loved the idea of this project, and I started to compile my list. As of right now, that list stands at 28 songs. It was 37. I was able to get down to 28. I am still trying to get down to 10. It’s difficult! Blister in the Sun by the Violent Femmes. For some reason, that story reminded me of this one–when we were in college, my roommate would blare this one before we went out on weekends. She’d stand on a chair in the middle of our dorm room and sing it at the top of her lungs. Good times. The King of Glory Shall Come In by Petra. The summer after I graduated from high school, I spent a week at Centrifuge at Carson Newman College. My brother was finally old enough to go on the same trips that I went on (not junior high), but of course we had nothing to do with one another. Not just at camp, but in life in general. One of these days I’m going to write up a blog posting of how I know God hears and answers prayer. Suffice it to say that it was at this particular event that I was truly moved, and my brother as well. There was a cassette tape (dating myself) that we all got to take, and this song was the one that we loved and played over and over. Reminds me of the power of grace, friendship, and faith. I Feel For You by Chaka Khan. You have to have context. In the mid 1980’s, Saturday Night Live was having another resurgence. To try and capitalize on the late night tv crowd, there was also Friday Night Videos. Because people my age weren’t supposed to stay up that late, there was a new television station called Nickelodeon that had an hour long show at 5pm every day called Nick Rocks that played music videos as well. So I’m at my Grandma’s, waiting for dinner. My Great Grandma was still alive, and she died in 1986, so this is probably around 1984 or so. Granny was only able to get around in a wheelchair by then, but she got up every day, bathed, dressed in a dress with hair in a bun and cameo brooch, and sat in her rocking chair in the living room while we went on around her. She would use a walker to get from the chair to the rocker, and then the walker would sit in front of her. That day, I was sitting in the wheelchair next to her (something my brother and I liked to do so that we could sit next to her instead of across the room) and watching Nick Rocks. I forget what came on before, or what came on after, but I know that this music video came on. After about a minute or so of it playing, Granny leaned forward on her walker and put her hand on my arm and said, “They sure do dance funny nowdays, don’t they?” To this day it still cracks me up. The Barber of Seville: Act 1 – Cavatina: Largo al factotum della città (Figaro), written by Rossini and performed by many. Again, you have to have the story. In 1997 I went to Salzburg, Austria during the Mozart Music Festival as a ministry with my childhood church, playing five+ octaves of handbells throughout the city during the festival. The Sunday we were there we went to the missionary’s church and played during their Sunday service and, since it was a Baptist Church after all, had a potluck lunch before having an instructional workshop on how to play the bells as we were giving a three octave set to the church as a gift. (I swear, they still had fried chicken and corn pudding in Salzburg for church potluck.) Anyway, Time for the workshop. Very difficult with a major language barrier. But there was one girl in our group that is a trained musician and very good. And unfortunately, she knows it. And she can be rather snooty if she’s not watching it, though she does try. So during the workshop, she was paired with this guy and I kept hearing her ask over and over again, very slowly, in English, “Can You Read Sheet Music”? The guy would simply look at her and nod. Then she’d ask again. And he’d nod and try to follow her instruction again. Over and over. Then she basically gave up, frustrated because she didn’t feel that he was learning a thing. Fast forward a few hours, and we’re in Mondsee for our evening concert. For reference, go watch The Sound of Music. You know that giant cathedral Maria gets married in? Yeah, that’s where we were playing. Beautiful church, horrid acoustics. So we give our concert, about 75 minutes, to a crowd of about 100 or so. As soon as we’re done, the missionary, Jerry, greets the crowd and does the usual translation schpiel. But this is the best part. After we were done, he asked us to stay because he had a gift for us. So we’re sitting around to see what he’s talking about. He turns to us and says that he is so excited. That morning, while we were in his German Sunday service, there was a second service of another language going on downstairs. One of his good friends, who had been living in Salzburg as he studied at the Mozarteum (think Austrian Julliard), missed our concert that morning because he was downstairs leading the music at the other service. He didn’t think his friend was going to get the opportunity to hear us play, but he was able to make it to that particular concert before he left in the morning to reclaim his spot as the lead tenor in the Bucharest Opera. As a treat, he agreed to sing for us one of the hymns that we had just played on the bells in his native tongue. When pressed for an encore, he sang “Figaro”. This guy, whose name I’ve never known? Yep, same guy that she kept asking “Can You Read Sheet Music”. Turns out not only could he read it, he speaks flawless English, and was trying to not be rude but to follow the instructions as she was giving them! 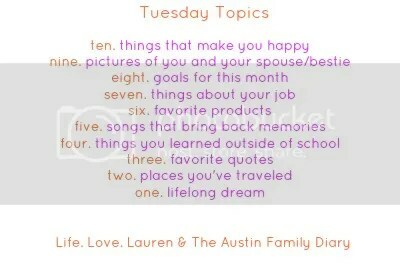 This entry was posted in Link Parties and tagged Music, Tuesday Topics. Bookmark the permalink. blister in the sun. i love that song! Great stories!! I bet that scrapbook will be awesome when you finally get it all narrowed down! !